iSperm was released commercially last August and has sold nearly 200 sets to farms around the world. 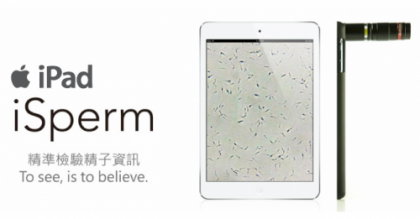 Call home, check your email, count your sperm: Taiwanese start-up Aidmics is hoping to cash in on the $40 billion global human fertility market with an iPad compatible gadget it calls iSperm. “In the US, one out of every six couples has trouble conceiving,” Lin, 35, told Reuters. Investment advisory Harris Williams estimates the global fertility market to be worth as much as $40 billion. Lin said he aims to price the iSperm device between $100 and $200, a fraction of the cost of the commercial version. Sam Wang, manager of a livestock farm in central Taiwan, is a convert. “Our pregnancy success rate increased by 20 percent after we started using this gadget,” said Wang, who uses the device to measure the fertility of his boars.